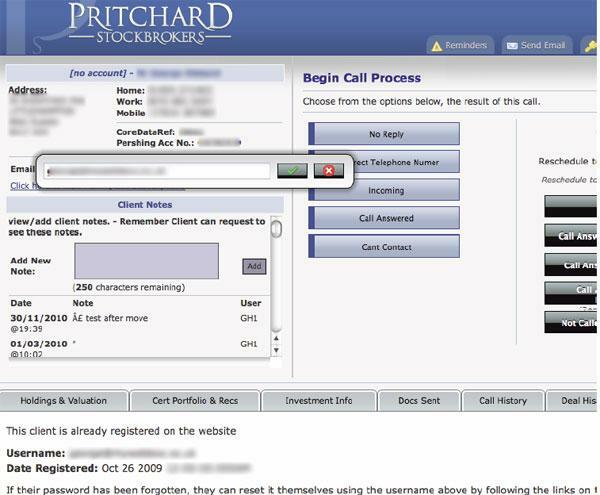 Create a web based stockbroking system from scratch for stockbroking firm Pritchard Stockbrokers. This particular project has been ongoing for the best part of a decade now. Every developer that is working or has worked for 3aIT has contributed towards what this system became, and to its offshoots. There were two core elements of this system. 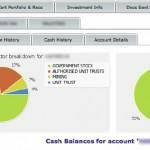 Firstly, the ability to store and search on the company’s client base (ie a CRM system). Secondly, the ability to generate deal slips from the share purchases / sales. Attached to this side of the system was a compliance process that ensured that the user had completed several checks to ensure that their client could be sold those shares. Other larger notable sections of this system included a cold calling system which cycles through a list of clients as specified by the customer, then the users of the system just hit a button, get a phone number, then click a button to record the outcome of the call. If the call was successful, that client would get assigned to the broker making the call as one of their clients. Another large section of the system allowed for all paper documents received from clients to be scanned and stored against their record in the database allowing for easy retrival at a later date. A project of this scale was achieved thanks to a very close working relationship Pritchard Stockbrokers, and an ongoing development contract which allowed for big projects to be completed over a short timescale. Of course, within this project were many smaller projects. Some of these were just a simple request for a report to display a certain set of data from the database in a certain way. However, also many of the problems involved much consultation with us to work out exactly the best way to solve that problem for them. Sometimes, after discussion with us, the client realised that the problem they thought they had wasn’t the problem they thought, so we were able to guide them away from requesting work that they didn’t need. A problem like this is not solved overnight, and indeed this project is still evolving now, however the initial version of this system was put in place in 2003. This was not intended to be the completed project by any stretch of the imagination, and this version of the system continued to slowly evolve into an entire stockbroking system solution with multiple reports, views and KPI as requested by the client.